My evening walks through Kihei consist of out of the way streets that lead to quiet beaches and endless vistas. One such street led me to Punahoa Condominiums. Built earlier than other developments in Kihei, it has only 15 units with a small sandy cove at the lawn's edge. The small private cove is out of your door for swimming, snorkeling and sunbathing. It is walking distance to Charlie Young Beach and Kamaole Beach Parks. Watch the surfers in the sunset as you walk to shops, restaurants and a major grocery store. 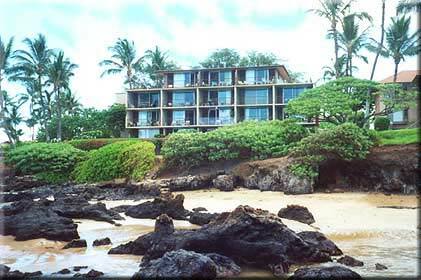 Punahoa Condominiums are lovely and charming units to stay in during your vacation on Maui. All vacation condos should be this way!